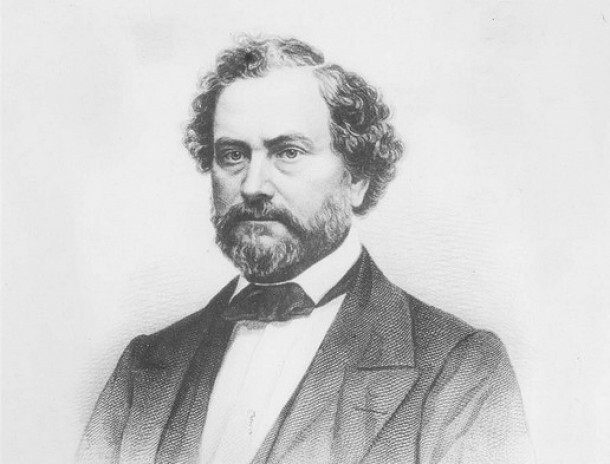 Hartford native Samuel Colt was an inventor and industrialist who made his fortune in the gun business. Founder of the Colt Manufacturing Company, he revolutionized manufacturing by patenting firearms with interchangeable parts and creating an assembly line on which to make them. Colt firearms figured in many of the nation’s wars, and at the start of the Civil War both the Union and the Confederacy purchased firearms from the Hartford businessman. Sam Colt died in 1862 in his native city. The factory complex and grounds of the Colt Manufacturing Company are listed on the National Register of Historic Places, and in 2006 Samuel Colt was inducted into the National Inventors Hall of Fame. “Colt Firearms Collection.” The Wadsworth Atheneum, 2016. Link. “The Colt Collection.” The Museum of Connecticut History, 2016. Link. Simon, Kenneth A, Will Lyman, Connecticut Public Television, and Connecticut Humanities Council. Colt, Legend & Legacy. DVD. Hartford, CT: Connecticut Public Television, 1997. “The Museum of Connecticut History.” Connecticut State Library, 2017. Link. “The Wadsworth Atheneum,” 2017. Link. Colt, Samuel. “Broadside: Colt’s Patent Repeating Pistols, Army, Navy, and Pocket Sizes.,” 1850. 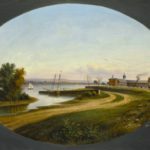 Connecticut Historical Society. Link. “Catalog Record of the Samuel Colt Papers, 1808-1904.” Connecticut Historical Society Library Catalog, 2016. Link. Pearce, Allen S. “Colt’s Sub-Marine Battery Mentioned in the Broadside: Premium Apparatus Electricity Yields to the Mandate of Science! Professor Pearce Will Exhibit His Apparatus ...” Gazette Office, Ca. -1860 1854. Connecticut Historical Society. Link. “Images - Colt’s Patent Fire Arms Manufacturing Company.” Connecticut State Library, 2016. Link. “Research Guide to Materials About Colt’s Patent Fire Arms Manufacturing Company.” Connecticut State Library, Museum of Connecticut History, 2016. Link. Barnard, Henry. Armsmear: The Home, the Arm, and the Armory of Samuel Colt. New York, NY: Alvord, 1866. Hosley, William N. Colt: The Making of an American Legend. Amherst, MA: University of Massachusetts Press, 1996. Colt, Samuel, Samuel Hamilton Walker, Eli Whitney, and John E. Parsons. Saml. Colt’s Own Record: Samuel Colt’s Own Record of Transactions with Captain Walker and Eli Whitney, Jr., in 1847. Hartford, CT: Connecticut Historical Society, 1949. Houze, Herbert G., Carolyn C. Cooper, Elizabeth Mankin Kornhauser, and Wadsworth Atheneum Museum of Art. Samuel Colt: Arms, Art, and Invention. New Haven, CT: Yale University Press, 2006. Lundeberg, Philip K. Samuel Colt’s Submarine Battery: The Secret and the Enigma. Washington: Smithsonian Institution Press, 1974. Grant, Ellsworth S. The Colt Armory: A History of Colt’s Manufacturing Company, Inc. Lincoln, RI: Mowbray Publishers, 1995. Grant, Ellsworth S. The Colt Legacy: The Colt Armory in Hartford, 1855-1980. Providence, RI: Mowbray Company, 1982. Rohan, Jack. Yankee Arms Maker; the Incredible Career of Samuel Colt. New York; and London: Harper & Brothers, 1935. Klein, Christopher. “History In The Headlines: 10 Things You May Not Know About Samuel Colt.” History.Com, July 18, 2014. Link. Glaser, Leah S. “Sam Colt Mines the Arizona Territory.” Connecticut Explored, Winter -2017 2016. Link. “The Fire At Colt’s Armory.” The New York Times, 1864, sec. Archive. Link. “The Homes of America. VII. Armsmear.” The Art Journal 2 (1876): 6. Link.